Lauri has been playing drums and percussion instruments from the age of five. He studied drums, piano, bass, singing, music theory, and band playing at the Pop & Jazz Conservatory and Töölön musiikkikoulu in Helsinki and Ebeli in Espoo. He has been working with children in schools and kindergartens for thirteen years, giving private drumming lessons and organising band camps. 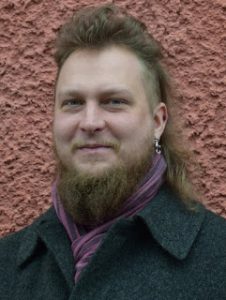 Currently, Lauri is working on his doctoral thesis in the field of cultural studies at the University of Helsinki. His favorite music genres include Nordic jazz, British progressive rock, French chanson and Tuvan throat-singing. With so many interesting opportunities available, I am unwilling to choose any single career path. Besides being a musician, I am working on my doctoral thesis in cultural studies at the University of Helsinki. I also work as a school attending assistant, mostly with autistic children. I studied drums, piano, bass, singing, music theory and and band playing at the Pop & Jazz Conservatory and Töölön musiikkikoulu in Helsinki and Ebeli in Espoo. I enjoy the diversity of music, preferring beautiful melodies and witty lyrics. These are combined for example in the music of the French band Noir Désir. Almost ten years ago I got the opportunity to play on the former main stage of Pori Jazz, the biggest jazz festival in Finland. As a child, my parents had taken me to festival every year, and now, on the stage, I could almost sense the energy of the great artists who had performed there before me. One’s first gig at the legendary rock club Tavastia is also an experience to remember. I can juggle with three balls. I enjoy traveling, having visited nearly every country in Europe. Some of my favourite countries to visit have been Kenya, Laos, Japan and Belarus. I do like reading. My favourite sports include football, mölkky, and disc golf.